1,050 watts per channel at two ohms, 800 watts at four ohms, and 520 at eight ohms. Bridgeable to 2,070 watts at four ohms. Grounded Bridge® design for low distortion and high reliability. ODEP output protection to prevent failures; distortion detector; bridge and parallel mono modes; high damping factor; full protection against shorted outs, mismatched loads, I/O DC, overheating, and high frequency overloads; plus much more make it totally flexible for lots of applications. Two balanced 1/4" and XLR ins, two binding post outs. Two RU. conventional amplifiers. The results are lower distortion and superior reliability. Patented ODEP® (Output Device Emulation Protection) circuitry compensates for overheating and overload to keep the amplifier working when others would fail. 0.05%, providing dynamic proof of distortionfree performance. modules that tailor the amplifier to suit specific applications, such as networking via HiQnetTM or TCP/IQTM. Balanced XLR and 1/4-inch (6.35-mm) phone jack inputs for each channel on the standard PIP2-FXQ module. Full protection from shorted, open and mismatched loads; general overheating; DC; high-frequency overloads; and full protection from internal fault are provided by our latest protection scheme: "Quad-Mute." Load Impedance: Safe with all types of loads. Rated for 2 to 16 ohms in Stereo, 4 to 16 ohms in Bridge-Mono and 1 to 4 ohms in Parallel-Mono mode. Required AC Mains: 50/60 Hz; 100, 120, 220 and 240 VAC (10%) units are available. All draw 100 watts or less at idle. Current, voltage and frequency requirements are provided on the units back panel. Frequency Response: 0.1 dB from 20 Hz to 20 kHz at 1 watt . Phase Response: 10 degrees from 10 Hz to 20 kHz at 1 watt . A-weighted: Better than 105 dB below rated full bandwidth power. 20 Hz to 20 kHz: Better than 100 dB below full bandwidth power. Total Harmonic Distortion (THD) at full bandwidth power: Less than 0.05% from 20 Hz to 1 kHz increasing linearly to 0.1% at 20 kHz. Intermodulation Distortion (IMD): (60 Hz and 7 kHz at 4:1) Less than 0.05% from 163 milliwatts to full bandwidth power. Slew Rate: (Slew rates are limited to useful levels for ultrasonic/RF protection). Greater than 13 volts per microsecond. Enable: A front panel push button used to turn the amplifier on and off. Level: A front panel rotary control for each channel with 31 detents used to control the output level. Stereo/Mono: A three-position back panel switch used to select Stereo, Bridge-Mono or Parallel-Mono mode. Sensitivity: A three-position switch inside the PIP compartment used to select the input sensitivity for both channels: 0.775 volts or 1.4 volts for standard 1kHz power, or a 26 dB voltage gain. Reset: A back panel push button for each channel used to reset the circuit breaker that protects each power supply. Input Ground Lift: This switch on the PIP2-FXQ is used to isolate input signal grounds from chassis ground to prevent ground loops. Enable: This amber front panel indicator shows the on/off status of the low-voltage power supply. Signal/IOC: Each channel has a green front panel indicator that flashes to show amplifier output. If a channels output waveform differs from its input by 0.05% or more, the indicator flashes brightly to show distortion. This function provides proof of distortion-free performance. In Parallel-Mono mode, the Channel 2 light stays on. ODEP: Each channel has an amber front panel indicator that shows thermal-dynamic energy reserve. Normally, each ODEP indicator is lit to show available reserve energy. In the rare event that a channel has no reserve, its indicator will dim in proportion to ODEP limiting. An ODEP indicator may also turn off under other conditions. Input Connector: Two balanced 1/4-inch phone jacks on the back panel and two balanced three-pin female XLR connectors on the factory-installed PIP2-FXQ. Input Impedance: Nominally 20 k ohms, balanced. Nominally 10 k ohms, unbalanced. 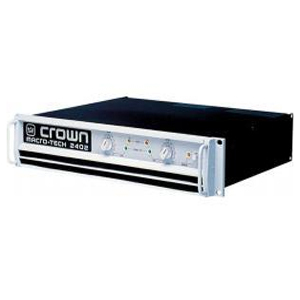 Input Sensitivity: Settings include 0.775 volts or 1.4volts for standard 1 kHz power, or a 26 dB voltage gain. Output Connectors: Two sets of color-coded 5-way binding posts (for banana plugs, spade lugs or bare wire). Output Impedance: Less than 10 milliohms in series with less than 2 microhenries. DC Output Offset: (Shorted input) 10 millivolts. Bridge-Mono: Balanced, single-channel. Channel 1 controls are active; Channel 2 should not be used. Parallel-Mono: Unbalanced, single-channel. Channel 1 controls are active; Channel 2 controls are bypassed. Turn On: Four-second delay with no dangerous transients. Steel chassis with durable black finish, aluminum front panel with Lexan overlay, and specially designed flow-through ventilation from front to side panels. Cooling: Internal heat sinks with forced-air cooling for rapid, uniform heat dissipation. Dimensions: Standard 19-inch (48.3-cm) rack mount width (EIA RS-310-B), 3.5-inch (8.9-cm) height, 16 inch (40.6-cm) depth behind the mounting surface and 2.5-inch (6.3- cm) protrusion in front of the mounting surface. Approximate Weight: Center of gravity is 6inches (15.2cm) behind front mounting surface. Macro-Tech 2402: 51pounds, 12 ounces (23.5kg) net; 65 pounds (29.5 kg) shipping weight.